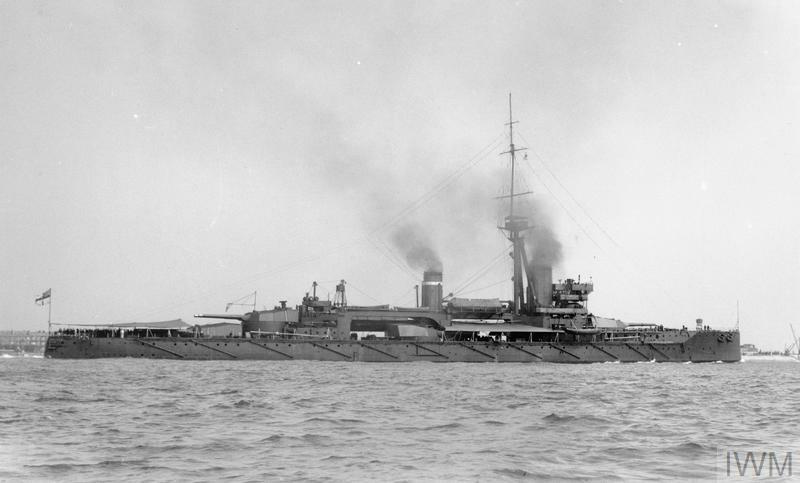 HMS Hercules was the second of the Colossus class of Dreadnought type battleships. The preceding class was Neptune. Hercules is the Roman derivative of the Greek Heracles, the hero son of the god Zeus and the mortal Alcmena, Heracles went insane killing his family and entire village, after this he was made to perform 12 great tasks to cleanse himself. The Royal Navy named five ships Hercules as shown in the table below. There was to be a sixth but she was not completed. 1759 The first Hercules was a 74-gun ship of the line. 1798 The second Hercules was a 78-gun prize ship taken in 1798. 1815 The third Hercules was a 74-gun ship of the line sold on in 1865. 1866-8 The fourth Herculeswas a single ship of the class central-battery ironclad battleship built in 1866-8. She was 325 feet long and of 8,800 tons displacement and in 1904 became the Calcutta based at Gibraltar as a depot ship. In 1914 she was renamed again and towed home to Portsmouth where as the Fishguard she was stripped of all above deck fittings and superstructure and used as an artificers training ship. She was sent for scrap in 1932. 1911 The fifth Hercules is the subject of this page. 1957 The sixth Superb was one of the six-ship strong Majestic class aircraft carriers. She was laid down on 12 October 1943 and launched on 22 September 1945. However work on the ship was not completed until she was sold to India in 1957 when she became the INS Vikrant in 1961. The Colossus class was a follow-on design to the Neptune class. There was originally meant to be three ships of the Neptune class, but a change to the armour scheme on the last two ships resulted in them being quite different from the Neptune, hence the single ship Neptune class, and the two ship Colossus class - Colossus and Hercules. The Colossus class was similar to the Neptune class; Neptune being the first capital ship in the Royal Navy to use super-firing where one main turret is placed on the centre-line above another turret. This produces a compact pair of turrets taking up less length in the ship needing less weight of armour for protection. An added gain is that both turrets can also fire on either beam. One of the problems was that muzzle blast from the upper turret could adversely affect the lower turret. This was a great concern in days when the guns were fitted with open sighting hoods. To prevent damage to the lower turret 'Y' by 'X' turret firing astern, 'X' turret was limited to firing no closer than 30 degrees from right astern. Another feature of the Neptune and Colossus classes were the midships turrets P and Q. On all previous British Dreadnoughts these were placed one abeam of the other and they could then only fire on their own side of the ship. On the Neptune they were staggered - en echelon - along the length of the ship allowing limited cross-deck firing. In theory this permitted a ten gun broadside but in practice, the cross-deck firing was not a success and would cause damage to the ship by muzzle blast from the turret so firing. 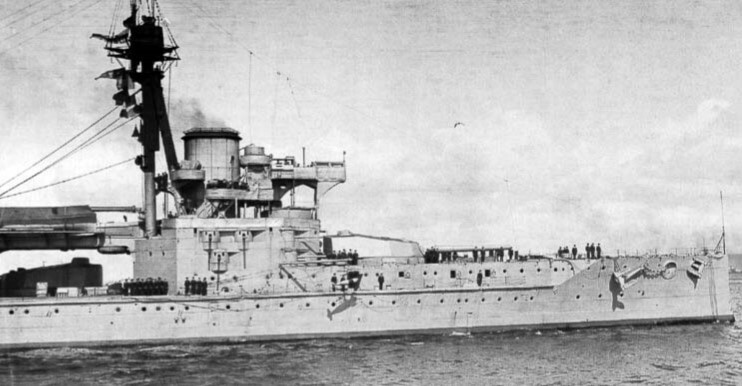 Although some length was saved by having 'X' and 'Y' turrets arranged for super-firing, the en echelon arrangement of the two midships turrets, 'P' and 'Q' took up a lot more space than the old abreast layout. To combat this a novel way of fitting the ships boats was devised. This consisted of a flying bridge type deck between the forward and aft deck houses, nicknamed the 'Marble Arches' after the RN offices of that name as they had an arched appearance. They were not a good idea; the fear was that in battle they could be damaged and drop onto the gun turrets below disabling them and they were removed during the war. The Colossus class was followed by the first of the 13.5" gunned Super-Dreadnought classes, the Orions. Both the Hull and machinery were built by Palmers Shipbuilding and Iron Company at their Jarrow on Tyne yard. Ordered under the 1908/9 naval estimates, she was laid down on 30 June 1909, launched on 10 May 1910 and commissioned 31 July 1911 at a total cost of £1,661,240. Hercules was fitted with quadruple propellers driven by Parsons direct drive steam turbines in a more or less identical layout to the Dreadnought with the exception that no cruising turbines were fitted. Instead an extra stage was fitted to the high pressure turbines; this was separated from the main turbine by a by-pass valve. As in the Dreadnought, Bellerophon and St Vincent classes, the high pressure turbines drove the inboard propeller shafts and the low pressure turbines the outboard shafts developing 26,559 SHP on trials at about 345 RPM giving a maximum speed of 21.5 knots. Normal power was 25,000 HP for 21 knots. In the Colussus class the engine rooms were for the first time split into three with the two inboard shafts leading into the centre engine room, and the outboard shafts to the port and starboard wing engine rooms. Steam was provided by eighteen Yarrow boilers arranged in three groups. Essentially coal fired, they were fitted with oil sprayers to permit faster raising of steam. Steam pressure was about 235 psi. Bunker capacity was 2,900 tons of coal and 800 tons of oil. Consumption at full speed was in the order of 360 tons per day, and range about 4,000 miles at 18 knots rising to 6,300 miles at 10 knots. Hercules was fitted with ten 12" C50 Mk11 guns in five twin turrets but the new weapon was not a success. Now fifty calibres in length, the longer barrel was designed to give higher muzzle velocities and thus greater range and hitting power. It used a larger propellant charge of 307 lbs against the earlier 12" guns 258 lbs of MD size 45 cordite. The larger charge did not always burn correctly within the barrel length resulting in a very poor shell spread pattern. Also the higher pressures within the gun barrel, something akin to 20-22 tons per square inch, caused serious wear and thus the guns only had a working life of around 220 rounds. Shell weights were the same for the earlier 12" guns at 850 to 859 lbs. The range was around 21,000 yards at 15 degrees elevation against 19,000 yards for the C45 guns of the earlier classes. The Idea of mounting the secondary battery on top of the main turrets had died a death and all the secondary armament was mounted in the deck houses. Twelve of these rather useless 4" guns, which were too small to stop a determined attacking torpedo boat, were fitted largely in casemates with another High angle (HA) 4" being fitted as an AA gun, four 3 pounder signalling guns were fitted. This class introduced the 21" torpedo with three submerged torpedo tubes being fitted, one on either beam and one firing stern, the stern tube being removed circa 1914-6. Not greatly different to the Dreadnought, these ships were similar to the Neptune, differing mainly in disposition of armouring and internal protection, however Neptune's internal protection was not used in the Colossus class. To save weight, the internal screens - torpedo bulkheads - were not continuous between the end barbettes and only protected the machinery spaces and magazines. The weight saved was spent on thicker belt armour. To compensate for the poorer anti-torpedo protection, internal subdivision was increased. Weights of armour were 4,560 tons vertical and 2,010 tons decks total 6570 tons. 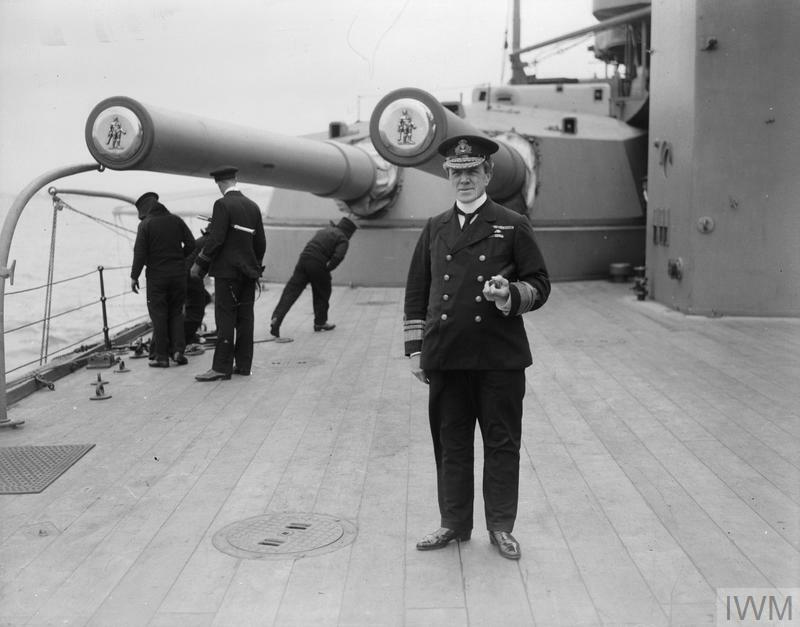 On commissioning on the 31st July 1911, HMS Hercules assumed the role of Flagship of the second division of the home fleet, remaining in that role except for a short period as flagship of the 2nd Battle squadron (BS) mid 1912 to early 1913. In march 1913 she was involved in a collision with a merchant ship, the Mary Parkes registered in Glasgow - Hercules received only minor damage in this encounter. The group of men shown in the image below alongside the aft end of A turret, and the three men on the deck below are rigging a mine-sweeping paravane, the torpedo shaped shadow of which can be clearly seen on the hull below the three men. This is streamed and then towed by a wire attached to a chain shackled to an eye at the base of the fore-foot. The chain can just be made out near the anchor running vertically down to the forefoot. As the ship steams through the water, the paravane sheers out from the ship and any mine cables crossed by the towing wire are directed down the wire to the paravane and into a cutter which will cut the mine mooring cable. Once floating on the sea-surface the mine will be destroyed by small arms fire, either detonating it or holing the casing and causing it to sink. This picture also shows the poor location of the spotting top, painted black near to the top of the mast, it is immediately behind the fore-funnel. With a head wind, smoke and hot gasses will make this spot untenable. Aft of the deck house and below the flying bridge deck - marble arch - can be seen the rear of 'P' turret on the port side. 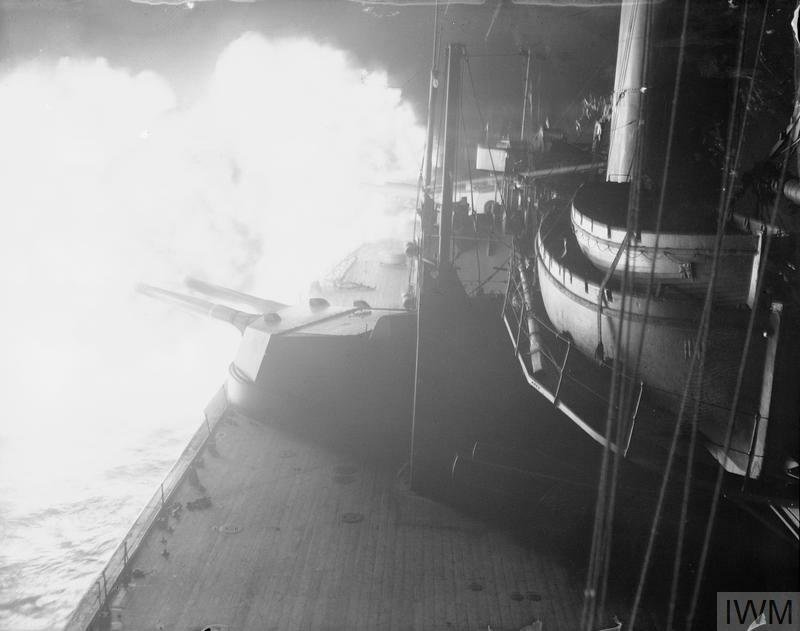 This could be turned towards the starboard side and fire across the deck but caused damage to the decks due to blast. Careful observation of the deck house will reveal several of the 4" guns in their casemates. In 1914 she joined the sixth division of the 1st BS of the Grand Fleet and was part of this division at Jutland on the 31st May 1916, led by Vice Admiral Sir Cecil Burney in Marlborough, followed by Revenge, Hercules and Agincourt. 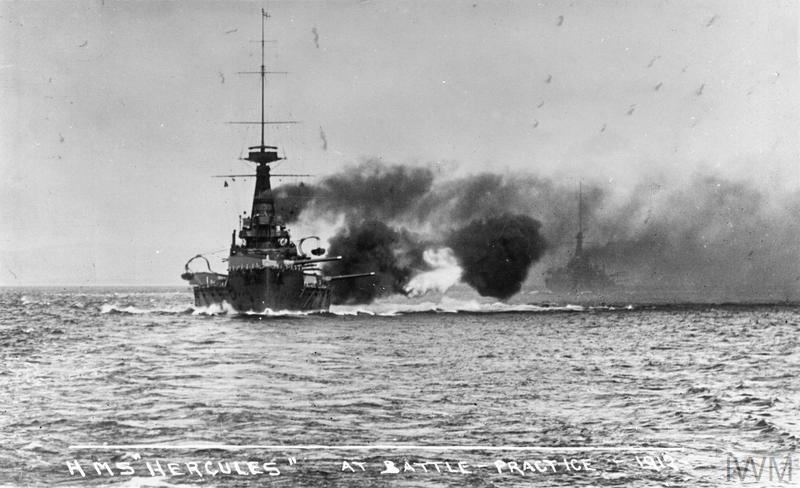 Hercules’s first action at Jutland came at 1816 when she was straddled by a salvo of five German shells deluging the ship in water right up to the fighting top. The enemy ships were at this time hidden in the mist and smoke with better visibility favouring the Germans. At 18:25 Hercules sighted her opponents and opened with seven or eight salvoes on what was thought to be a Kaiser class battleship; due to poor visibility, firing ceased without any confirmed hits. She also fired briefly at the disabled German light cruiser Weisbaden but so many ships fired at this hapless ship that it is impossible to tell who actually hit her. Just after 19:00 Hercules sighted the Seydlitz and fired six salvoes of high explosive rounds (HE) claiming hits with the 5th and sixth salvoes; history credits her with two hits. One of these shells passed through the upper searchlight platform then passing through a ventilation trunk before carrying on overboard without exploding, the second shell hit an anti-torpedo net boom just aft of the No3. Port 5.9" gun. The hit was on the 11.25" armoured belt. The shell being HE did no damage to the belt but the hull plating below the belt was bulged in over an area of 30 by 11.5 feet, several frames were bent and flooding took place over 40 feet of wing compartments. Around 19:25 she fired several 12" salvoes and used her 4" secondary battery on the 6th and 9th German destroyer flotillas that were attacking with torpedoes. The range was reportedly just 6,000 yards. Shortly after this she was near-missed (40 yards) by two German torpedoes - only a sharp turn to port saved her from being hit. Due to poor visibility she engaged no further targets. During the German High seas flight to the south after breaking off the engagement, damage to Marlborough causing a reduction in her speed forced Vice Admiral Sir Cecil Burney to transfer his flag to the Revenge and Marlborough returned to the Tyne for repairs. This manoeuvre left the 6th division trailing 45 miles astern of the main Grand fleet so was for them the end of the battle. In total the Hercules fired 98 rounds of 12" shell – of which 82 were HE, 12 Common Percussion capped ( CPC or semi AP) and just 4 rounds of armour Piercing Capped ( APC). She also fired 15 rounds of 4" at the destroyers. Although being hit by splinters from the German 'straddles' at 18:25, she only had minor damage and received no casualties. Following the years of routine manoeuvres and fleet operations that she carried out during the remainder of the war she was part of operation Z on the 21st November 1918. She was in the Southern line of British warships which accepted the surrender of the German High Seas fleet into internment in the Firth Of Forth. On 3 December 1918 Hercules task was to take the Allied Armistice Commission to Kiel. She was escorted by the V class destroyers : Verdun, Venetia, Viceroy and Vidette and returned one week later. It was a rare event for one ship to fly three Admirals (British, French and American) flags at the same time. In 1919, superseded by the newer battleships and now showing her age, she was reduced to category C reserve at Rosyth and on 8 November 1921 she made one more voyage to Kiel - this time under tow for the German ship-breakers yard.